The headwaters of the Cache La Poudre River begin at Milner Pass along Trail Ridge Road and the Continental Divide. From Poudre Lake, the Cache La Poudre River will begin it's journey towards the South Platte River east of Greeley and eventually the Atlantic Ocean. 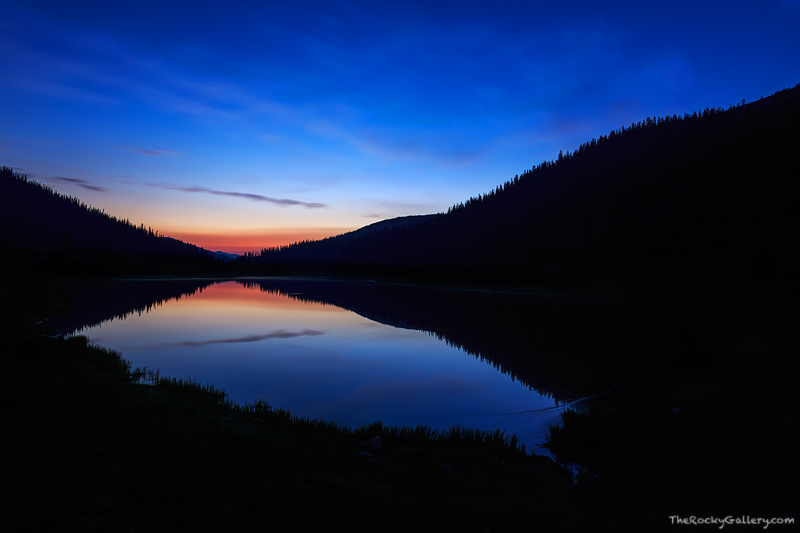 Sunrise over Poudre Lake creates an opal like reflection in the smooth waters of the lake while smoke from far off forest fires colors the horizon of Rocky Mountain National Park in a glowing red. 'Cache La Poudre' means 'hide the powder' in French and the river was so named by early French fur traders who trapped and hunted in this area. Legend has it these fur traders were forced to hide or 'chace' their powder along the banks of river during a snowstorm. Photo © copyright by Thomas Mangan.